Share your favourite entertainment betting here. She is an amazing actress. Be nice to see her win and at those odds, worth a bet on it too. Perhaps it's time for Leonardo DiCaprio to finally win. Singles only. Settled on the sitting President of the USA making a statement confirming without doubt the existence of alternative life beings from another planet. 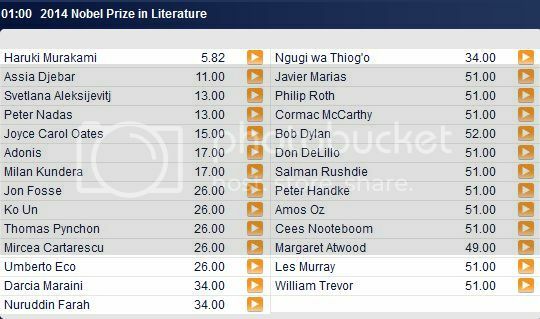 Even with Murakami there's a nice profit. Pffff... Matthew McConaughey! He shouldn't have won. but that's my humble opinion. I don't know what to say, I haven't watched the movie yet. Not a huge fan of Matthew, until the True Detective that is (I recommend this Show to everyone). I feel a bit sorry for Leo though. When will Ireland next win the Eurovision song contest? Singles Only. Applies to the year of the next Eurovision Song Contest that Ireland wins outright. Wow, I am quite surprised to see Romania so high on the favourites list! Our song was chosen by the public last weekend and I don't think it has a chance to win the contest. But who knows?